Judging by how much is being spent, Los Angeles is about to hold the most important school board election in American history. As of Monday, candidates and their backers have poured $6.4 million into races for three seats, with most of that — about $5.4 million — coming from labor groups and deep-pocketed charter school supporters who oppose union influence in education. At stake in the fiercely contested campaign is control over a complex, underperforming school district whose ability to improve schools for nearly 665,000 students is compromised by declining enrollment, a $1.46 billion projected deficit, and billions of dollars in unfunded liabilities for retirees. The election, as in past years, transcends the candidates in pitting the teachers union and its vision of improvement — more spending, smaller class size, expanded wraparound services, and local schools — against reformers who have been fighting to end seniority-based protections and pay, close struggling schools, and give families more school choices. Given charter-friendly state laws, the union has been unable to staunch the flow of students to charters even when it has controlled the board: LA Unified now has about 107,000 students in charters — which are generally non-unionized — more than any other district in the country. Union membership has reportedly dwindled from 45,000 members in 2008 to about 32,000 last year. Trying to stave off the threat to its influence, United Teachers Los Angeles last year raised its annual union dues by about one-third to $1,000 in preparation for the election. It has spent about $1.6 million through its independent expenditure committee, $1 million of it to support board President Steve Zimmer, who’s in a tight race for re-election. But it has also spent an untold amount on a separate public relations campaign supporting Zimmer that is now being investigated by California’s Fair Political Practices Commission. Reformers and charter school supporters, including the political arm of the California Charter Schools Association and LA Students for Change, a group funded by former Mayor Richard Riordan, have spent about $3.3 million through their groups. They have outspent UTLA and other unions as of Monday, campaign finance records show. These figures far outpace even the large increase nationally in school board election spending; a National School Boards Association report cited by Beth Hawkins stated that even in large districts (more than 15,000 students), only 1 in 10 board members said they spent more than $25,000 on their races. By contrast — even though experience has shown that spending doesn’t necessarily improve turnout — the two sides in LA Unified are on pace to exceed the $7.4 million spent in the district’s 2013 election, which appears to be the most expensive race in any district. Even so, voter turnout Tuesday is expected to be historically low, Schnur said. Two years ago about 10 percent of eligible voters cast ballots. Four years ago, when there was a highly contested mayor’s race, turnout was about 20 percent. The final outcome might not be determined until May’s general election. If no candidate receives more than 50 percent of the votes Tuesday, the top two vote-getters will head to a runoff. If the candidates supported by the reformers sweep the election, they will regain a majority on the board. Richard Garcia, a spokesman for the CCSA Advocates, challenged the notion that voters are uninterested in the race. “We have found that because of the presidential election and the tension since that election, the political sensibilities of voters have been heightened, they are more engaged and education is high on their list of priorities,” he said. Garcia said the CCSA Advocates have invested in this election because policies set by the LA Unified school board are a barometer for California and the nation. “What happens at the board level will ripple throughout California, and the ears and eyes of Sacramento are on the district,” he said. The danger of a reform-backed takeover seems to be reflected in rhetoric from the union leadership, which has been stronger than in the past, many observers say. UTLA President Alex Caputo-Pearl repeatedly rails against billionaire philanthropists who are trying to “privatize” public education. Caputo-Pearl was re-elected last week to his second three-year term as union president by an 82 percent majority of the union membership on a platform of higher salaries, strong benefits packages, smaller class sizes, and battling charter school growth, the LA Times reported. The District 4 race, encompassing the city’s affluent west side, has received far more coverage than the others. 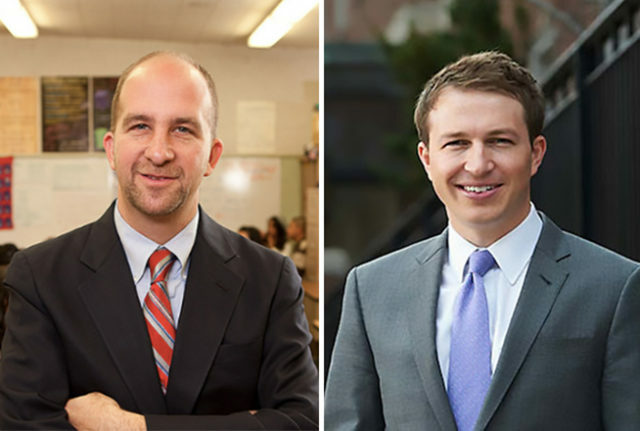 Most of the money, mud-slinging, and media attention has landed here, as two-term incumbent Zimmer, backed by the teachers union, has faced a tough reelection bid against three challengers. His leading opponent, Nick Melvoin, an educator, lawyer and reform advocate, is backed by prosperous donors and received high-profile endorsements from the Los Angeles Times, the California Charter Schools Association, and two former LA mayors. (Current LA Mayor Eric Garcetti — who faces little ballot opposition Tuesday — has endorsed Zimmer.) Melvoin launched his challenge more than a year ago and has raised nearly $425,000, more than any school board candidate going into a primary since LA lowered its individual contribution limit to $1,100 in 2007 the same year former board member Tamar Galatzan raised $2.9 million. The change gave rise to the use of independent expenditure committees, which have no donor limits but must not coordinate with a candidate’s campaign. 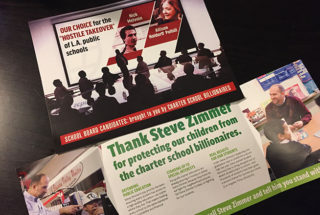 UTLA has depicted Melvoin and Allison Holdorff Polhill, another reform-backed candidate in District 4, on a mailer headlined “The candidates who will implement the Trump/Devos education agenda in LA.” Both candidates oppose Trump and DeVos, however. Outside interest groups on both sides have stuffed postboxes with mailers and flooded TV, radio, and digital space with negative ads. Melvoin’s platform calls for decreasing bureaucracy and directing more money to classrooms, while Zimmer said he will continue to work on closing the equity gap if he is reelected. Reformers and the teachers union are also contesting an open seat in District 6, with six candidates looking to represent the East San Fernando Valley. With its focus on re-electing Zimmer, UTLA has effectively conceded the ballot’s third seat, in the downtown area that comprises District 2, to the board’s longest-serving and reform-backed member Mónica García. García’s bid for a final term is being challenged by Lisa Alva, a veteran district teacher whom UTLA did not endorse or support but who was endorsed by the Los Angeles Times and the union that represents LA Unified administrators. The union’s abstention reflects García’s strength; in her previous reelection bid, it financially supported three of her opponents — its campaign was known as “anyone but Monica” — but García easily won the primary against her challengers. The battle between charter school supporters and groups that support traditional public schools in Los Angeles has been waged since the late 1990s when then-Mayor Riordan backed charter-friendly board candidates. Mayor Antonio Villaraigosa, his successor, did the same. Villaraigosa, who unsuccessfully attempted to win control over the board as mayor and will be a gubernatorial candidate next year, appeared at a candidate forum last week, the same day he endorsed Melvoin. He said he has been trying to bring more attention to individual candidates in order to boost voter turnout. “It’s why I challenged the whole notion of a school board, I’m saying, because everybody wants one and then we’re not voting and we’re not holding them accountable in the way that we need to,” he said at the forum. Raphael Sonenshein, executive director of the Pat Brown Institute for Public Affairs at Cal State LA, which has co-sponsored candidate forums in each district, said the two factions have fought to a draw. “It almost seems like the beginning of the sense of fatigue in the battle,” he said. Sonenshein said there was a time when charter schools were dominating the entire debate among school board candidates. “You can only argue for so long,” he said.